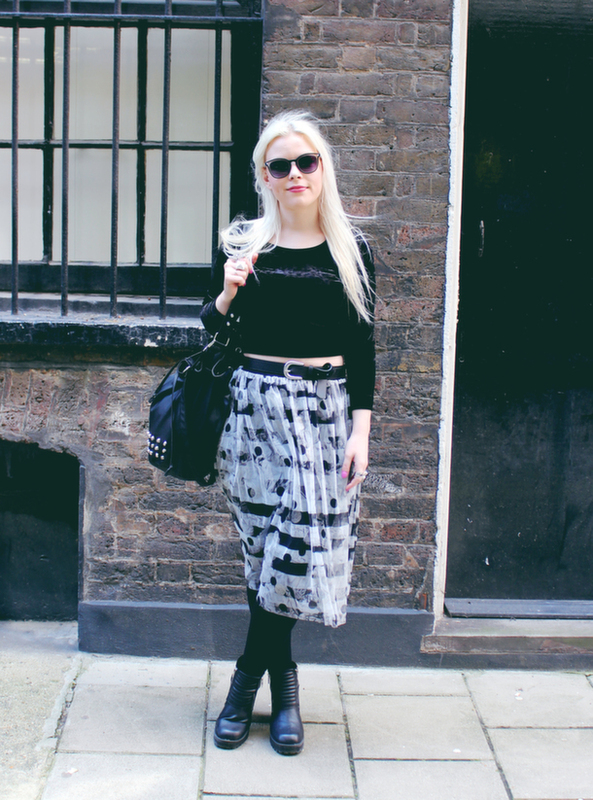 The starting off point for this look was this amazing Topshop skirt. It’s extremely sci-fi, yet put-together, which I love. I bagged this for just £10 back in the January sales, and have worn it a tonne since. It has a black bodycon skirt underneath, and then an amazing striped, spotted and metallic mesh overskirt, which I think is so dramatic! I paired down the skirt with a simple velvet long sleeved top from Primark, and then opted for my beloved H&M boots, which I affectionately refer to as my ‘Millas’ after Milla Jovovich, they just look like something she’d wear in Resident Evil to me, or The Fifth Element! Accessories-wise, I kept the belt simple, this is actually just a few pounds from H&M, and I threw on practically every ring I own, Phoebe from Friends style, it’s my favourite way to wear them! The bucket bag is practical, yet edgy with the stud details and was a bargain at £9 from Primark. The sunglasses as usual are Forever 21. On the day this was shot, Jade and I were lucky enough to get a sneak peek of New Look’s AW14 collection, so you can check out my full blog post on that here. Similarly, if you’d like to see this outfit in video form, a vlog of the event and the outfits we wore can be found on my Youtube channel here.